So I have learned a lot over the last 8 weeks of summer. Not the basics like, don’t forget to put on sunscreen. Or, always park in the shade. Those I’ve got down. I learned a lot about myself by deciding to take College Algebra online in 12 weeks. Notice that I haven’t necessarily learned all that much Algebra. See my current actual score to show just exactly how much I have not mastered? For those who know me, and that I have maintained a 4.0 in school, my shock is as great as yours. This is not fun. Here’s a short list of what I HAVE learned. #1. School is a commitment that I need to take seriously. Sacrifice required. #2. Summer classes are shorter, therefore more intense. #3. Online classes are too easy to ignore. Especially when you don’t really like the subject. #4. College algebra is really hard. #5. College algebra online is really really hard and should not even be allowed. #6. Textbooks and websites are not the best way for me to learn. I prefer having an instructor. #7. It is hard to admit when I need help. #8. I have inconvenienced personal friends and their families to get help. #9. The school offers free tutoring assistance, and it is my home away from home. #10. There are only 10 more days of this hell I am putting myself through, and I think I’m going to live after all. I have cut out most of the fun things in my life, and the joke is I’m spending my time with Al (short for Algebra). I don’t really like him, he’s picky, he’s a perfectionist, he’s very abstract at times, and it feels a little abusive. I really want to break up with Al. But I’m too far into it to quit without big penalties, so I’ll just tough it out. There is light at the end of this tunnel, one way or the other. Either I will do well on the final and pass, or I won’t. And if I fail the exam, then I am pretty sure that I won’t die. The world will continue to spin. I’ll have to recommit to Al, but only for another semester. This is the part that has been the biggest thing for me to learn. It’s not the end of the world. My self worth is not so enmeshed with my GPA that I can still be proud of my efforts. It’s one class. It’s one semester. I am grateful that I can see the bigger lessons that I am learning. Whether or not I can remember the mid point formula or how to find the inverse of a logarithm remains to be seen. There is a cool feature on the learning platform called “what if”. Simply plug in your pretend score and see what happens to your grade. 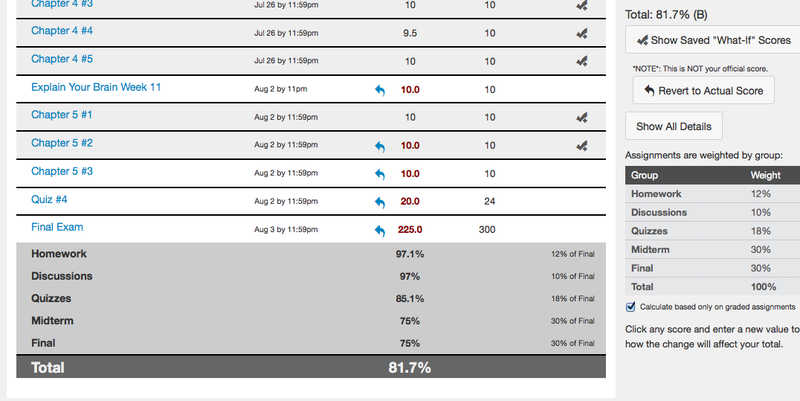 I may actually be able to hit a B for this class if I do well on the final, and by well I mean a 75. That seems completely miraculous to me. Especially considering that I Al has had me in tears more than once. As one of my tutors said, I am not used to the struggle. I saw a glimmer of hope last night in the final sections of this class. I understood it! It made sense! Al was nice to me last night, and I am encouraged to keep going. Thanks for your prayers! Until next time….